Rudolph might have been different, but he wasn’t the only one in the North Pole with a secret! 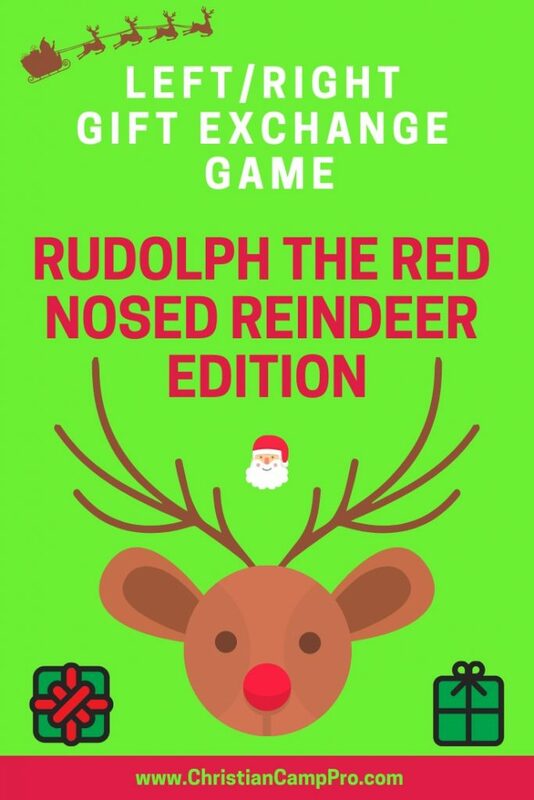 Use this fun and hilarious game to distribute door prizes, Secret Santa, or gag gifts. Give each guest a gift and have them sit in a circle. Read the following story aloud and instruct the guests to pass the gifts to their RIGHT or LEFT as the story prompts. Whatever they are holding at the end of the story is theirs to keep! Blinky the elf knew that something just was not RIGHT about the newest young fawn to arrive at the North Pole. Rudolph looked as cute as a baby reindeer should: bright eyes, fluffy tail, perky ears. Still, something was off and Blinky could not put his foot RIGHT on it. Of course, it all came to light not long after Santa had LEFT for a reconnaissance mission to check on which little girls and boys were naughty and nice. Blinky had LEFT the workshop early to bring over the training materials to all the new reindeer parents. It was important that each new fawn had the RIGHT training in order to be considered for Santa’s Sleigh Team, and the earlier they could get started, the better. Blinky LEFT the pamphlets in the mailbox of the cave where Rudolph and his parents lived. As he LEFT to go back to the workshop, he could not help but overhear the conversation between the young reindeer and his father. Blinky was puzzled by the conversation and moved closer to the cave to try to see what the two deer were arguing about. As he peeked around the RIGHT corner of the cave, Blinky was shocked and amazed at what he saw. Young Rudolph had a bright red nose! Blinky must have gasped at the sight because the two deer looked RIGHT at him. Blinky held up his RIGHT hand to quiet the reindeer. “Is that RIGHT?” asked Rudolph’s father. Rudolph’s dad did not look quite convinced, so Blinky went RIGHT on. Rudolph let out a long sigh and looked relieved. “See dad?” he said. “One doesn’t have to look just RIGHT to work for Santa. Special thanks to WOL CAMPS for making this Rudolph the Red-Nosed Reindeer gift exchange story possible.